When I saw the rosary linkup over at Suspicio, well. 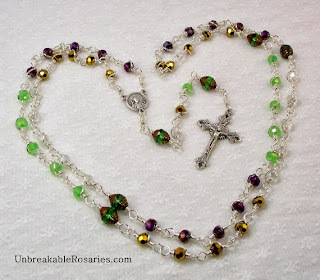 Anybody who knows me knows that I justify buying a new rosary pretty much seasonally, so I thought it would be fun to talk about a few of the rosaries in my collection that I use most frequently. I can't even tell you how many rosaries I've loved and lost, or broken over time, I'm just a complete rosary hoarder. Yes, I have a problem. This is a single decade rosary that I've had since April 2011. 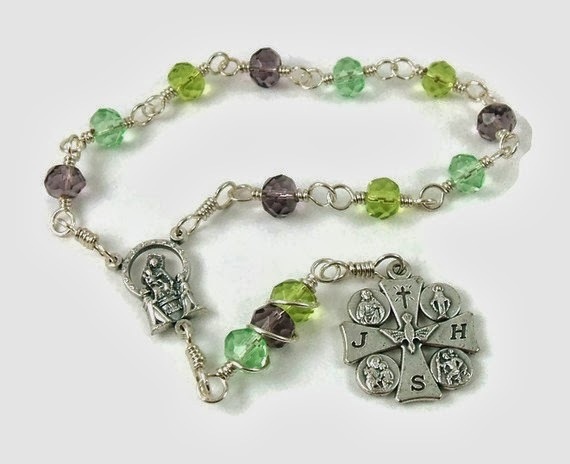 I remember when I bought it so well because it was the month my best friend came into the Church and I bought it along with a rosary to give her at the Easter Vigil. I had it with me for that trip to NYC to see her baptized and confirmed, and with me when I delivered Anne 3 weeks later. I carry it with me in my pocket a lot because it's small and fits easily. I love the beads on this one, They are oblong and faceted, and they feel very nice between the pads of your fingers. I can use this easily when I pray the rosary in the car, which I do daily, since it doesn't hang down and get tangled in things as I drive. I love the four way cross on this rosary, as it features a Miraculous Medal, St. Joseph, St. Christopher, and a scapular medal. The center is an image of Our Lady giving the rosary to St. Dominic, and how perfect is that for this Lay Dominican? When I pray with this rosary, I think of the global Church, and how we are all a family. 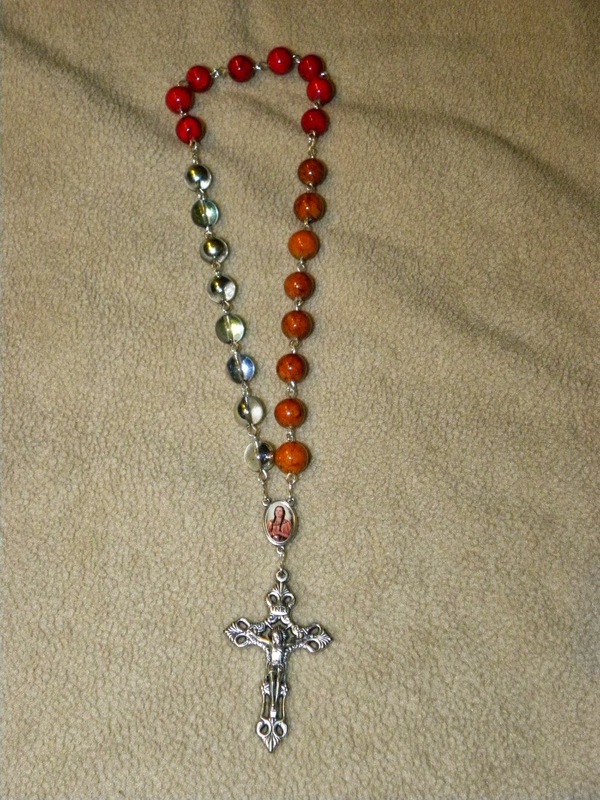 This is a rosary I bought just this past Easter. I really wanted a rosary with a John Paul II center, since he is just one of my favorite people of all time, and this one has an image of him as well as Benedict XVI! I love the Easter colors, they make me happy just to look at them. I really love the crucifix too, it's very delicate, with hearts inscribed on it. Right after this rosary arrived, our basement flooded, and I prayed with this rosary while taking shifts baling water from the floor with Mike. 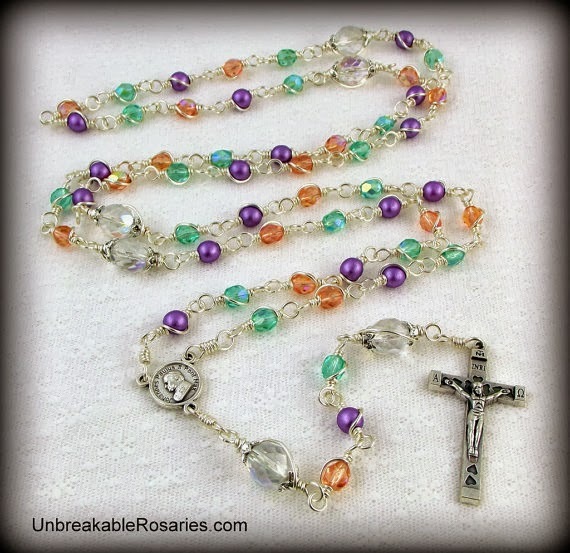 I keep it in my purse in it's own special pouch and take it out when I need a pick-me-up.This is my Hope in the Resurrection rosary. This is Henry's rosary, I bought it for him for his First Reconciliation, which he made this past May. He picked it out because he loves the colors, and it actually has the same centerpiece as mine, with John Paul II and Benedict XVI on it. Cosmic connection! We pray a decade on it sometimes before he goes to bed (when he can be still for a whole decade :)), and he sleeps with it under his pillow, to keep bad dreams away. He assures me that this is a very effective method of dream management. The 7 Sorrows of Mary. A wonderful and touching Lenten devotion. I really take praying this chaplet to heart, and feel sad when I meditate on the sorrows. The black beads seem perfect on this one. The Kateri Indian Rosary, in honor of my Mohawk heritage and my dad's confirmation saint when he joined the Church in the early 1990's. My parents had been married for over 20 years before my dad converted, so St. Kateri is pretty special in our house. Our Lady Star of the Sea, given to me by my precious group of knitting friends who know of my love for chaplets. The smooth beads on this one are just wonderful to pray with, and the colors are a perfect reminder of the sea. I pray this a lot when a problem is on my mind, and I want to ask Our Lady to help me navigate it. 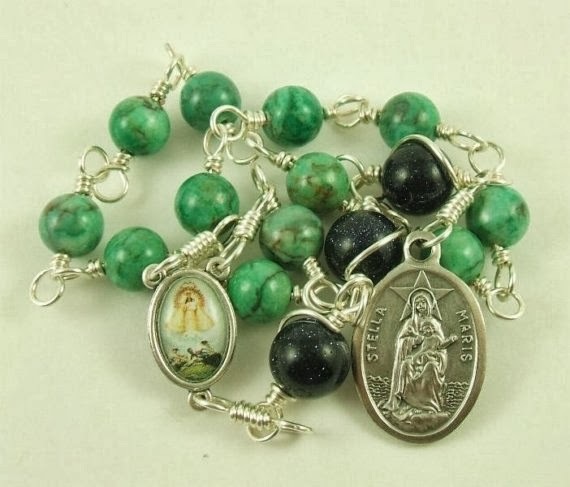 And I may or may not have just ordered a St. Therese chaplet, because my devotion to her has increased this month after reading about her more. I also have a gift rosary that I'm using right now to pray and sort of spiritually join forces with the upcoming recipient, because somehow this makes total sense to me. 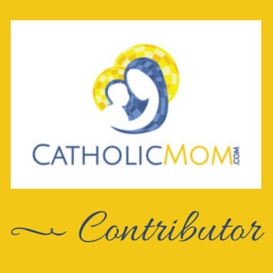 #crazyCatholicgirl. 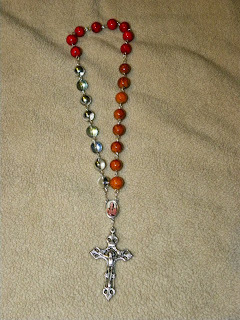 I also may or may not have an autumn colors rosary on order. I'm admitting to nothing, please don't judge me. Beautiful...I love the first single decade one. I prefer a single decade for the car too since I am such a klutz and WOULD manage to tangle it in something. Um I want at least three of these! I love the first one as well. And I also love... ok, I love all of them. But I have a problem with Rosaries. They complete me! Seriously, do you remember where you got it? 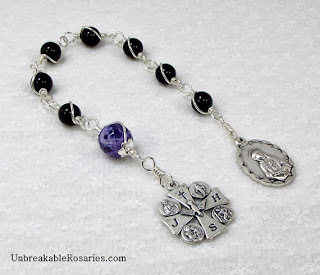 I've asked Veronica to make me a 7 Sorrows Chaplet that matches the rosary she made me for my Christmas gift this year. I really like the 4-Way medal on your rosary, very pretty. Thanks for sharing pictures of your rosaries with us. This is so much fun because now when one of us mentions our rosary, the rest of us can picture it. Hi Jenny, I totally agree, what a lovely idea!